What is the best Zimmer Cryo for my practice? The Zimmer Cryo 6 and Zimmer Cryo Mini are the Zimmer Coolers that are currently in-production. The Cryo 5 has been replaced by the Cryo 6 about 8 years ago. Please contact our sales department, Phone 1-800-530-8041, to discuss what Cryo unit will be best for your practice sales@zimmercryo.com. What is the warranty for the Zimmer Coolers? A New Zimmer Cryo 6 comes with a 2 year limited warranty, and the warranty period for a New Zimmer Cryo Mini is 1 year limited warranty. The Warranty is provided by the manufacturer, Zimmer MedizinSystems. We accept Visa, MasterCard, American Express, and Discover. In addition, for qualified accounts, you may pay by Purchase Order, Check, Bank Checks, and Wire Transfer. For qualified customers we can offer payment terms and financing options. Please Contact Us for additional information please call 1-800-530-8041. Do you sell New and Used Zimmer Cryo units? We sell New Cryo 6 and New Cryo Mini units as well as Used Zimmer Cryo units (Depending on Availability). In addition we sell Refurbished Zimmer Cryo units (Depending on Availability). The difference between an Used Zimmer Cryo and Refurbished Zimmer Cryo is Warranty and Service. The Used Zimmer Cryo units are sold “As Is, Where Is” compared to the Refurbished Zimmer Cryo units which normally come with a warranty period and new replacement parts. What is the delivery time after purchase? Delivery time of a New Zimmer Cooler can be as fast as next day. It really depends on your requirements, your location, and what is in stock. A New Zimmer Cooler unit will ship out faster than an used or refurbished Zimmer Cooler. We primarily use Integrated Express for our Zimmer Chiller deliveries. Please call #800-530-8041 with questions. What is the Zimmer Cryo 6? The Zimmer Cryo 6 can deliver an air temperature of around -30c, at adjustable fan settings (9 Speeds), onto the desire treatment area. The Cryo Six can be used for skin cooling in conjunction with dermatological laser treatments to reduce pain and thermal damage to skin tissue. The Cryo Six requires no consumables to operate, has an optional articulating arm for hands free operation, glass top to accommodate accessories, and a clear LCD display for easy operation. To learn more about the Cryo 6 Zimmer Cooling features and specifications please visit the Cryo 6 Page or call Phone #800-530-8041. What is the difference between a Cryo 6 & Cryo Mini? The Cryo 6 has the ability of producing a therapeutic air stream of around -30c, the Cryo Mini around -10c. The Cryo Mini has a reduced chilling capacity and should be used for treatments that are short in duration/ time. The Cryo 6 can be used for treatments that are short and long in duration/ time. The Cryo Mini has a smaller footprint than the Cryo 6 and Cryo 5, and a New Cryo Mini comes with a 1 year limited warranty compared to a 2 year limited warranty for a New Cryo Six. Please visit the Zimmer Chillers Comparison Page for additional information or call #800-530-8041 with questions. How can I purchase a Cryo 6 Hose & other Cryo 6 parts? You can purchase a Cryo 6 Hose and other Cryo 6 Parts (Therapy Fan, Power/ CPU Board, Articulating Arm, etc…) at our Store: shop.zimmercryo.com. You may also call 1-800-530-8041 or email us at sales@zimmercryo.com. What maintenance should I regularly perform? The Zimmer Cooler units have an air filter and condensation container that need to be monitored and maintained on a regular basis. The air filter, located on the rear of the units, should be vacuumed weekly. This will help remove dust particles on the filter and allow the Cryo unit to filter the air more efficiently. The condensation container, located on the bottom of the Cryo 6 and side of the Cryo Mini, needs to be drained as the unit’s condensation fills it up. A built in sensor and warning light will alert you when this container needs to be emptied. To prevent mildew you might want to consider adding two drops of a disinfectant. What is the difference between a Cryo 6 & Cryo 5? The Cryo 5 was the original Zimmer Cooler, and has been replaced by the Cryo 6 and Cryo Mini. The Cryo 6 and the Cryo 5 have the ability of producing a therapeutic air stream of around -30c, the Cryo Mini around -10c. The Zimmer Cryo 6 and Zimmer Cryo Mini have 9 fan speeds compared to 6 fan speeds of the Zimmer Cryo 5. The Cryo Mini has a reduced chilling capacity and should be used for treatments that are short in duration/ time. 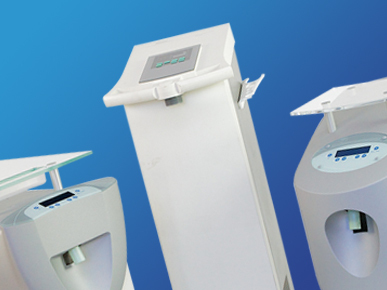 The Zimmer Cryo 6 and Zimmer Cryo 5 can be used for treatments that are short and long in duration/ time. The Cryo Mini has a smaller footprint than the Cryo Six and Cryo Five, and a New Cryo Mini comes with a 1 year limited warranty compared to a 2 year limited warranty for a New Cryo 6. Please visit the Zimmer Chillers Comparison Page for additional information or call #800-530-8041 with questions. What is the Zimmer Cryo 5? The Zimmer Cryo 5 was the first Zimmer Cryo introduced, and has since been replaced by the Zimmer Cryo 6. The Cryo Five had the ability to deliver an air temperature of around -30c, at adjustable fan settings (6 Speeds), onto the desire treatment area. The Cryo Five required no consumables to operate, had an optional articulating arm for hands free operation, and had a long treatment hose. To learn more about the Zimmer Cryo 5 features and Zimmer Cooling specifications please visit the Cryo 5 Page. Can I trade-in or upgrade my Cryo 5 cooler? You have the option of Upgrading or Trading-In your current Zimmer Cryo 5 unit for either a New Zimmer Cryo 6 or New Zimmer Cryo Mini unit. Please call us at #800-530-8041 to discuss our Trade-In Program or email us sales@zimmercryo.com. How do I purchase a Cryo 5 Hose & other Cryo 5 parts? You can purchase a Cryo 5 Hose and other Cryo 5 Parts (Therapy Fan, Power/ CPU Board, Articulating Arm, etc…) at our Store: shop.zimmercryo.com. You may also call #800-530-8041 or email us at sales@zimmercryo.com. The Zimmer Cooling units have an air filter and condensation container that need to be monitored and maintained on a regular basis. The air filter, located on the rear of the units, should be vacuumed weekly. This will help remove dust particles on the filter and allow the Cryo unit to filter the air more efficiently. The condensation container, located on the bottom of the Cryo 6, side of the Cryo Mini, and rear of the Cryo 5, needs to be drained as the unit’s condensation fills it up. A built in sensor and warning light will alert you when this container needs to be emptied. To prevent mildew you might want to consider adding two drops of a disinfectant. Please call us for customer support #800-530-8041. Is the Cryo 5 still being manufactured? The Cryo 5 is no longer in production and has ultimately been replaced, as of 2008, by the Cryo 6 unit. The Cryo 6 and Cryo Mini are the two Zimmer Coolers that are in-production. Please visit our Zimmer Chillers Compare Models Page to compare the units side by side. Please call #800-530-8041 with any questions you might have regarding the Zimmer Cooler units. What is the Zimmer Cryo Mini? The Zimmer Cryo Mini can deliver an air temperature of around -10c, at adjustable fan settings (9 Speeds), onto the desire treatment area. 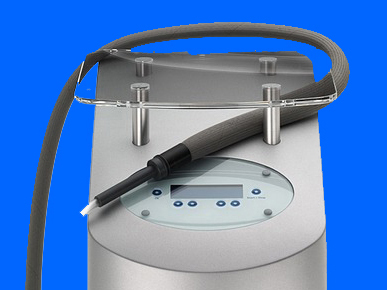 This Zimmer Cooling unit can be used for skin cooling in conjunction with dermatological laser treatments to reduce pain and thermal damage to skin tissue. 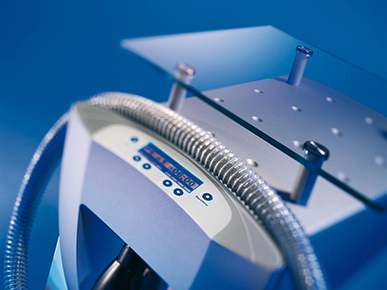 The Cryo Mini requires no consumables to operate, has an optional articulating arm for hands free operation, glass top to accommodate accessories, and a clear LCD display for easy operation. To learn more about the Cryo Mini features and specifications please visit the Cryo Mini Page. What is the difference between a Cryo Mini & Cryo 6? The Cryo 6 has the ability of producing a therapeutic air stream of around -30c, the Cryo Mini around -10c. The Cryo Mini has a reduced chilling capacity and should be used for treatments that are short in duration/ time. 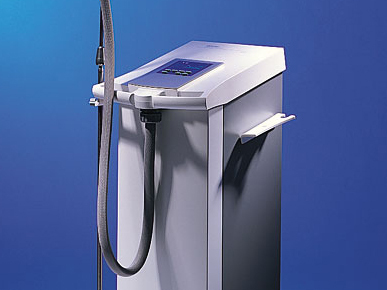 The Zimmer Cryo 6 can be used for treatments that are short and long in duration/ time. The Zimmer Cryo Mini has a smaller footprint than the Zimmer Cryo 6 and Cryo 5, and a New Cryo Mini comes with a 1 year limited warranty compared to a 2 year limited warranty for a New Zimmer Cryo 6. Please visit the Zimmer Chillers Comparison Page for additional information or call #800-530-8041 with questions. How do I purchase a Cryo Mini Hose & other Cryo Mini parts? You can purchase a Cryo Mini Hose and other Cryo Mini Parts (Therapy Fan, Power/ CPU Board, Articulating Arm, etc…) at our Store: shop.zimmercryo.com. You may also call #800-530-8041 or email us at sales@zimmercryo.com. The Zimmer Cooling units have an air filter and condensation container that need to be monitored and maintained on a regular basis. The air filter, located on the rear of the units, should be vacuumed weekly. This will help remove dust particles on the filter and allow the Zimmer Cooler unit to filter the air more efficiently. The condensation container, located on the bottom of the Cryo 6 & side of the Cryo Mini, needs to be drained as the unit’s condensation fills it up. A built in sensor and warning light will alert you when this container needs to be emptied. To prevent mildew you might want to consider adding two drops of a disinfectant. Are any consumables required to operate the Zimmer Cryo Mini? All the Zimmer Chillers cool through the medium of air, so no consumables are required of the Zimmer Cryo Mini, Zimmer Cryo 6, and Zimmer Cryo 5. Unlike other laser cooling methods (ice packs, topicals, cryogen spray) the Zimmer Chillers can cool the skin before, during, and after a laser treatment. COMPARE MODELS. REQUEST SERVICE. GET SUPPORT. PURCHASE A PART. WHATEVER YOUR ZIMMER COOLER NEEDS ARE, WE ARE THERE TO MEET THEM. Request assistance for your Cryo 5, Cryo 6, or Cryo Mini unit. Purchase parts and accessories for your Zimmer Cryo 5, Zimmer Cryo 6, or Zimmer Cryo Mini. Find answers to frequently asked questions about the Zimmer Coolers. View photos and videos on the Zimmer Cryo 5, Zimmer Cryo 6, and Zimmer Cryo Mini. Buy Cryo 5 Hose, Cryo 6 Hose, Cryo Mini Arm, and Other Zimmer Cryo Parts & Accessories. Compare price, dimensions, fan speeds, and other important features of the Zimmer Coolers.